Davis Winborne, a freelance photojournalist, remembers the night he and several other journalists were forcefully loaded into a van by police while covering a protest in St. Louis last September. 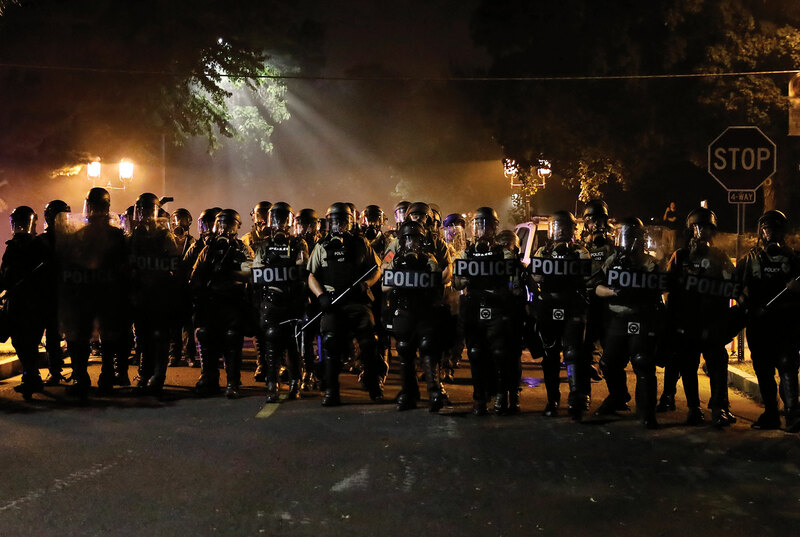 This was his third night covering the protests that followed the acquittal of former St. Louis police officer Jason Stockley in the shooting of Anthony Lamar Smith. This night felt different he said; the police were more on edge, and the protesters had been growing more aggressive. He had a feeling the night was not going to end well. After the beanbag shots, Winborne said, a Jeep roared toward the group, which at this point was 70 percent protesters, 30 percent journalists. Fresh on their minds was the death of Heather D. Heyer, who was killed after a car plowed into a crowd of protesters a month earlier in Charlottesville, Virginia. “We all jumped out of the way, and then the windows rolled down and it was full of cops,” he said. The police ran toward the group, screaming for them to get down on the ground after firing pepper spray in the air. 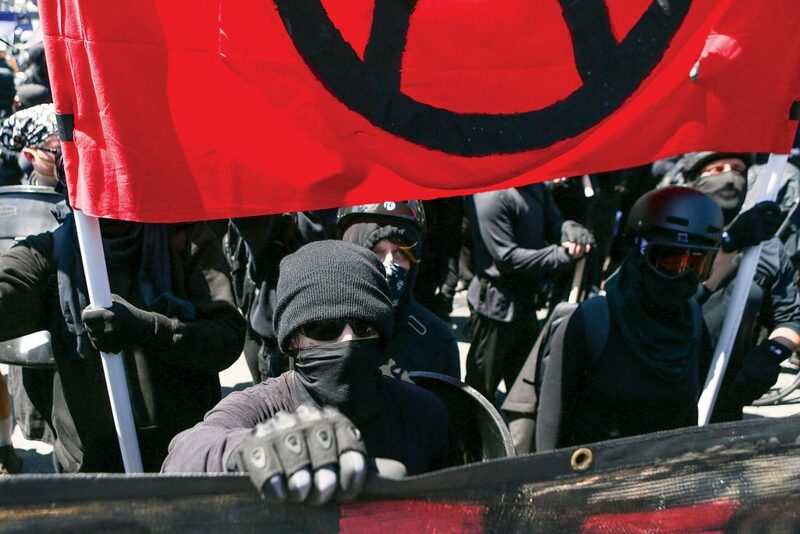 Winborne said all the protesters, who for the most part were shirtless and wearing black masks, ran away, but the journalists, wearing khakis and carrying camera bags, froze and threw their hands in the air. Instead, Winborne said, an officer grabbed him and threw him against a wall where there were three other journalists forced into the same position. With zip-tied hands, Winborne was able to lean back and shimmy his helmet off. A photojournalist for less than a year, he said he expected something like this to happen to him at some point. Since January 2017, 46 journalists have been physically attacked or had equipment damaged in targeted incidents or while working in the United States, according to the U.S. Press Freedom Tracker, the website launched by the Freedom of the Press Foundation in August. If you have been physically attacked or experienced an arrest, equipment seizure, harassment or other threat, you can submit the incident to the Press Freedom Tracker here. Peter Sterne, a senior reporter at the foundation and managing editor of the Press Freedom Tracker, said the website was launched to help the public better understand the risks journalists in the United States face every day. “They are not being imprisoned for long periods of time or killed, but they are facing physical attacks and arrests,” Sterne said. David Minsky, a freelance journalist who was beaten by masked protesters in August while covering protests in Berkeley, California, said being a journalist can be dangerous, especially if you are covering a protest. “Just because you have a camera and notepad and a jacket that says press, that doesn’t mean you are safe,” he said. During protests, journalists are “being squeezed on all sides,” said Mickey Osterreicher, general counsel for the National Press Photographers Association. These days, physical attacks against journalists seem to be coming more from citizens than police, something he attributes to people not understanding the First Amendment. Maintain situational awareness: Know what is going on around you and how it may affect your safety. Identify yourself as a journalist. Dress appropriately: Dress neatly, wear light-colored clothing, consider eye protection and a face mask. Activate tracking and auto-lock features on phones, equipment. This information was compiled from NPPA. For more tips, click here. Part of being a journalist sometimes means going places the public cannot, including war zones, protests and natural disasters. Covering these events can bring their own challenges, such as potential violence and threats to personal safety, but it also allows information to be shared with the public, Osterreicher said. Minsky said when he arrived around 1:30 p.m. to Martin Luther King Jr. Civic Center Park, it was already a chaotic scene. He was expecting to cover a white nationalist protest, but it had been cancelled and instead turned into an anti-fascist demonstration. With two iPhones, a reporter’s notebook and a DSLR camera around his neck, Minsky began taking photos and livestreaming what he was seeing. Shortly after, he said, he was approached by a protester with a scarf over his face. Minsky said all he could do was try to protect his camera and his phones. At one point, the protesters stopped attacking him. That’s when, he said, a woman, wearing a sports bra and cutoff jeans, came up to him, and the beating continued. Then another woman, clad in black, hit him with a metal pipe. Minsky said he tried to keep backing away and was worried someone might stab him. A U.S. Navy veteran, Minsky has been working as a journalist for 12 years. He said he has covered many protests like this and is angry about how everything unfolded that day. “In the U.S., the most dangerous place to be a journalist is at a protest,” Sterne said. Chase Karacostas, a reporter for The Daily Texan, the newspaper at the University of Texas, Austin, said he has covered a half-dozen protests since the fall of 2016, but had never been physically attacked. That changed Sept. 1, when he was covering an immigration protest on campus. Karacostas said he arrived at the protest and began interviewing people with his iPhone and sharing content on social media. Twenty minutes into his reporting, while he was in the middle of an interview, he said, a protester came up to him and pushed his phone into his face. When the phone was pushed into his face, it left a 1-inch cut near his eyebrow. Karacostas had to get six stitches for the injury. “As reporters we tend to brush off attacks because we don’t want to be the story or see ourselves as the story,” Shapiro said. Maria Leal, a reporter at KAPP-KVEW outside Yakima, Washington, never wanted to become the story. But on Oct. 30, while setting up her camera to interview a local candidate for city council, she and another reporter were chased and threatened by a man with a knife. When the candidate showed up, the man yelling at them walked away. Leal said she and the other reporter set up the mic and began the interview. After they began asking questions, the man came back and this time seemed more aggressive, Leal said, at one point throwing a beer bottle. The man eventually stopped chasing them and barricaded himself in a nearby house, resulting in a standoff with police. Leal called her manager, who, she said, was shocked by what he heard and asked if she wanted to stay to cover the story unfolding or go home. She decided to stay. Continuing to cover a story after being attacked is exactly what veteran journalist Randy Turner did. He worked as a newspaper reporter for 22 years, before becoming a teacher and starting the website, The Turner Report, an online publication focusing on local news in the Joplin, Missouri, area. On Sept. 11, 2017, as Turner was preparing his annual post reflecting on the 9/11 attacks, he heard a knock on his door. When he answered the door, he said, the man outside asked if he was Randy Turner. When Turner told him he was, the man punched him in the face, knocking him to the ground. When he could finally pull himself up, Turner said, he went to Facebook to look up the profile of the person he thought was his assailant. Two to three days before the attack, Turner said, he published a story about a former supervisor at a local fast food restaurant that focused on allegations of sexual misconduct and DUI charges. “I learned a valuable lesson: Look through a peephole,” Turner said. He said being on his own, without a major newsroom behind him, may have made him more of a target. Victims of attacks against journalists tend to be freelancers, Sterne said. “I think people, including the police and protesters, are less likely to view them as real journalists and are more likely to rough them up,” Sterne said. Turner said he has been threatened many times throughout his 20-plus year career, where he primarily produced investigative stories. But had never been physically attacked. The internet and online publishing bring a different dynamic to how users respond to news stories, he said. “I can post something on my blog or on Facebook, and people go ballistic,” he said. As verbal attacks against journalists continue to mount, experts expect physical attacks to rise as well. “The general political climate, stirred up by ‘fake news,’ and this undermining of a free and independent press is all coming together in another perfect storm,” Osterreicher said. Lynn Walsh is a project manager at Trusting News Project and a past president of the Society of Professional Journalists.